Tried and tested technology for perfect results: sawing and milling from FEIN. High grade steel processing, building kitchens, metal processing and industry – FEIN jigsaws are designed perfectly for the high loads experienced when working with steel and stainless steel. As genuine specialist metal tools, FEIN jigsaws maintain a constant stroke and therefore constant cutting speed even under extreme load levels. The sturdy metal housing and resilient gears make these legendary enDurance tools, often last decades. 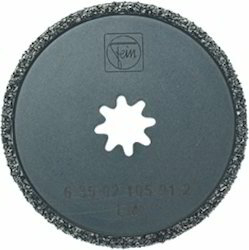 The FEIN range is supplemented by tools for pipe processing: jigsaws for pipes with a diameter of up to max. 440 mm, mainly for plant construction and community supply connections. FEIN also manufactures special pipe milling machines for pipes with a diameter of up to approx. 3,000 mm for plant and pipeline construction. Old windows are removed from their reveal in just one cut: the process is quick and precise, produces virtually no dust, and requires very little effort. 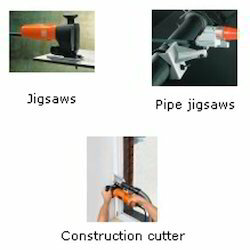 If the construction cutter is held at an angle during the cut, the cutting line is directly above the old window frame. Otherwise, it’s at a distance of 7 –8 mm from the old window frame which is ideal for the frames around modern insulation glass windows. 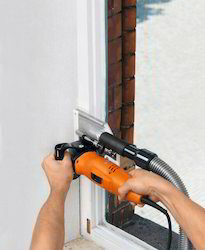 The FEIN SUPERCUT is the ideal supplement to the FEIN construction cutter, allowing the remaining window frames to be removed simply, quickly and cleanly without the risk of further damage. The FEIN construction cutter is fitted with electronic overload protection, which effectively protects the motor from overload. This firstly ensures that the tool enjoys a long service life and secondly prevents annoying down times. FEIN pipe milling machines are world renown in the field of pipe cutting technology. Their applications range from trimming pipes before laying to cutting pipes already lowered into the ground. Whether cast or steel pipes for oil, gas or water as used for pipelines in municipal supply networks, power plants, and industrial systems as well as for container construction – reliable and precise work with FEIN pipe milling cutters. 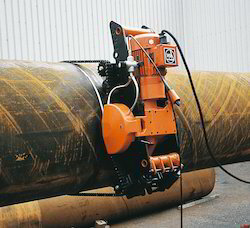 Optimized technology ensures improved cutting performance.Especially under difficult conditions such as pipe ruptures, the system proves its utilisability. By selecting the right gear ratios the ideal cutting and advance speeds can be adapted to various pipe materials. This makes cost-efficient use of HSS and carbide tools possible. 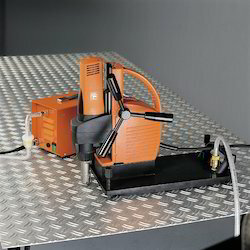 FEIN pipe milling machines are adjusted to different pipe diameters by changing the wheel base. The clamping is done by two link chains. The number of necessary chain links and the working space needed may be found in the table on the right. FEIN pipe milling machines are world renown in the field of pipe cutting technology. Their applications range from trimming pipes before laying to cutting pipes already lowered into the ground. Whether cast or steel pipes for oil, gas or water as used for pipelines in municipal supply networks, power plants, and industrial systems as well as for container construction – reliable and precise work with FEIN pipe milling cutters. Optimized technology ensures improved cutting performance. Especially under difficult conditions such as pipe ruptures, the system proves its utilisability. By selecting the right gear ratios the ideal cutting and advance speeds can be adapted to various pipe materials. This makes cost-efficient use of HSS and carbide tools possible. FEIN pipe milling machines are adjusted to different pipe diameters by changing the wheelbase. The clamping is done by two link chains. The number of necessary chain links and the working space needed may be found in the table on the right. Powerful, robust compressed air and three-phase AC motors for use even under extreme conditions. Electric motors providing power even at sub-zero temperatures. 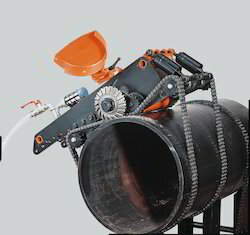 Electric pipe milling machines with advance and return motion (return motion only in non-load condition). Suitable for pipe diameters from 250 mm to 3,000 mm diameter. 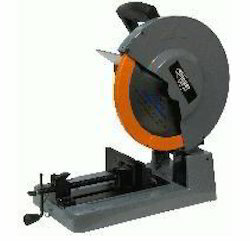 Profile or straight cuts with profile cutter or saw blade. Precise tracking and clean cuts thanks to the two-chain system, adjustable track setting, and double chain tightening. Simple assembly due to optimized handling. Available in two gear types, with different advance and rational speed sequences appropriate for the material. Advance and milling drive connected by gears. Overload protection of the gear by slipping clutch. Special models with the divided drive shaft for cutting thick-walled pipes and containers available on request. 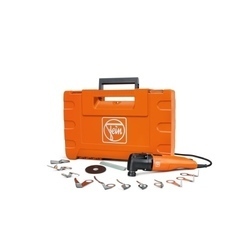 Wide selection of FEIN accessories. FEIN pipe milling machines are world renown in the field of pipe cutting technology. Their applications range from trimming pipes before laying to cutting pipes already lowered into the ground. Whether cast or steel pipes for oil, gas or water as used for pipelines in municipal supply networks, power plants, and industrial systems as well as for container construction – reliable and precise work with FEIN pipe milling cutters. Optimized technology ensures improved cutting performance. Safety due to self-start lock. Overload protection for the three-phase AC motor. Constructed and tested according to EN 61029. (classification EExeIIT3) for universal cutting. switch (classification EExdeIICT6), especially suited for cutting oil and gas lines. FEIN pipe milling machines are world reknown in the field of pipe cutting technology. Their applications range from trimming pipes before laying to cutting pipes already lowered into the ground. Whether cast or steel pipes for oil, gas or water as used for pipelines in municipal supply networks, power plants, and industrial systems as well as for container construction – reliable and precise work with FEIN pipe milling cutters. Optimised technology ensures improved cutting performance. Protection for work on water, oil, and gas pipelines because of compressed air power. Motor drive parts made of stainless materials. The lamellas of the compressed air motor are non-swelling. Even brief dry-runs are possible. Suitable for use in drinking-water area. 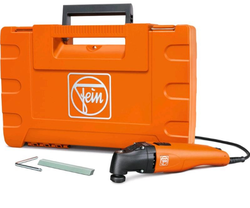 High grade steel processing, building kitchens, locksmith work, metal processing and industry – FEIN jigsaws are designed perfectly for the high loads experienced when working with steel and stainless steel. As genuine specialist metal tools, FEIN jigsaws maintain a constant stroke and therefore constant cutting speed even under extreme load levels. The sturdy metal housing and very heavy-duty transmission make these legendary endurance tools, often lasting decades. The FEIN range is supplemented by tools for pipe machining: jigsaws for pipes with a diameter of up to max. 440 mm, mainly for plant construction and community supply connections. FEIN also manufactures special pipe milling machines for pipes with a diameter of up to approx. 3,000 mm for plant and pipeline construction. Metal jigsaws with continuously variable speed control for unsurpassed precision, robustness and service life. Metal jigsaws with unsurpassed precision, robustness and service life. High-grade steel processing, building kitchens, locksmith work, metal processing, and industry – FEIN jigsaws are designed perfectly for the high loads experienced when working with steel and stainless steel. As genuine specialist metal tools, FEIN jigsaws maintain a constant stroke and therefore constant cutting speed even under extreme load levels. The sturdy metal housing and very heavy-duty transmission make these legendary endurance tools, often lasting decades. The FEIN range is supplemented by tools for pipe machining: jigsaws for pipes with a diameter of up to max. 440 mm, mainly for plant construction and community supply connections. FEIN also manufactures special pipe milling machines for pipes with a diameter of up to approx. 3,000 mm for plant and pipeline construction. Powerful hacksaw for pipes and profiled sections. Powerful hacksaw for pipes and profiled sections with continuously variable stroke adjustment. 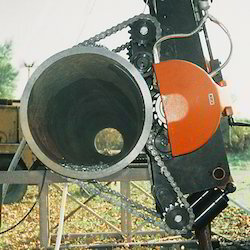 Compressed air hacksaw for pipes and profiled sections. Bevel up to 45 degrees. Faster, cleaner, safer and more affordable than other metal cutting equipment, the innovative SluggerMetal Cutter saw cuts steel as easily as plywood! 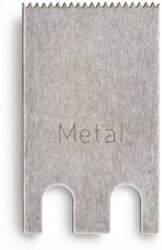 Its specifically designed cover collects virtually all chips and sparks and the ability to bevel increases the capability of the tool in a way no other metal cutter can match. 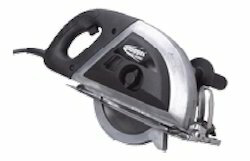 The Slugger metal cutting saw is an incredible, high-quality power tool. •Bevel up to 45degrees. 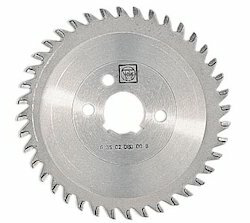 We are one of the leading manufacturer and supplier of HSS Circular Saw Blade. We obligated to meet the quality standards as per the customer demand. We are one of the leading and prominent manufacturer and supplier of Super Cut Automotive-FSC 1.6 Q. We obligated to meet the quality standards as per the customer demand. 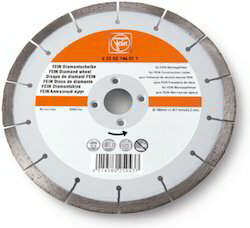 Leveraging on our industrious professionals we are providing Diamond Saw Blade to our customers. It has accurate dimensions and is highly robust as well. This product is made in accordance with the set industry standards. It has unique texture and is highly rated among our customers. Packaging of this product is excellent. We are producing this product on massive scale in order to cater to the rising demands. It is basically used for cutting different types of hard and abrasive material. We are presenting this product in various types to our customers. We are providing this at economical rates. Being quality oriented firm, we are engaged in providing Diamond Disc to the clients. Diamond Disc is manufactured by experience team with special emphasis on the finishing. This product is designed by unique work by very well experienced workmanship with best of the designs in the fashion class and by using quality approved material at manufacturer’s base. Offered range is available in vibrant options and designs, in order to fulfill the variegated requirements of customers. This product is checked by quality norms. Minicut Saw Blade offered is suitable for ripping cut softwood and hardwood and is also used for single sided veneered/plastic-coated board. or damage to the wall. High grade steel processing, building kitchens, locksmith work, metal processing and industry – FEIN jigsaws are designed perfectly for the high loads experienced when working with steel and stainless steel. As genuine specialist metal tools, FEIN jigsaws maintain a constant stroke and therefore constant cutting speed even under extreme load levels. The sturdy metal housing andvery heavy-duty transmission make these legendary endurance tools, often lasting decades. The FEIN range is supplemented by tools for pipe machining: jigsaws for pipes with a diameter of upto max. 440 mm, mainly for plant construction and community supply connections. FEIN also manufactures special pipe milling machines for pipes with a diameter of up to approx. 3,000 mmfor plant and pipeline construction. 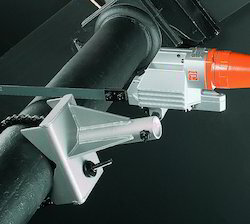 FEIN offers alternative clamping fixtures for materials and workpieces with which the core drilling unit’s electromagnet cannot be used. These range from a suction plate for non-magnetic materials like stainless steel or aluminium and a vacuum plate for e.g. chequered metal or bulb plate, which is used in conjunction with a vacuum pump to a fixture for drilling pipes with a diameter of between 60 and 300 mm. Vacuum plate for non-magnetic materials and structured bases (chequered metal, bulb plate etc. )Must be used in conjunction with the vacuum pump. Looking for Sawing And Cutting ?